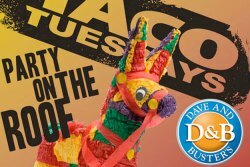 From Del Taco to Rosa’s Cafe to Taco Bell, no one really knows the source — but #TacoTuesday is a thing known to kids (and parents looking for a quick bargain) across this great land of ours. It’s fun. It’s cheap. It’s even famous on ‘the Twitter,’ from what our parents tell us. Yesterday, a happening place known to Texans for sports, games, and fun called Dave & Busters (that has no business chiming in on a day known for such snackable TexMex goodness), decided to tweet on this most festive of occasions. And did so in a slightly-racist-but-we-have-the-jokey-jokes fashion. The tweet may have been deleted but the conversation is still visible to everyone — will someone in charge of social media at anywhere finally realize that this is not necessarily the job for a hipster with little to lose but a paycheck? We already broached this subject in July when some “skilled social media ninja” from American Apparel tweeted a picture of a glorious fireworks display that actually depicted the explosion of the Space Shuttle Challenger. Bill Cosby, who has a few things going on lately, began his downward spiral thanks to some wunderkind thinking that #CosbyMeme would be a good idea. That will be LULAC on Line 1. Don’t worry about a busy signal though — the trolls don’t call; they just tweet. What’s worse about this dunderheaded move is that it’s not even original (as seen on Google Images). And, as Anthony Bourdain once told us, tacos as we know them today were invented in Texas, not Mexico. D&B can’t even get their racism right! The responses were comical, such as “Betcha No Juan will get fired for this. #RacismTuesdays” and others, but the point is clear: if you’re going to mess up, Twitter is not the best place to do it. Because there is either no second set of eyes to police decisions like this, or, even more importantly, there is only one young mind at work. How else would a Space Shuttle explosion be misconstrued as fireworks? How does a meme contest regarding an extremely famous (and terribly polarizing) individual not get reconsidered? And why turn to Twitter to steal a racist-ish idea? If anyone asks why social media is now a PR thing, please see exhibit one here with a side of potato skins and 20 tokens to call your boss.